Close Air Support (CAS) has been a great enabler for the coalition forces (CF) in Afghanistan. ISAF enjoys dominance in the air and the insurgents do not have any effective surface-to-air weapons. Most CAS is provided in situations where there are "Troops-in-Contact" or TiCs. History of Close Air Support. As long as there have been aircraft armed with weapons there has been close air support to ground units in times of conflict. For a history of close air support see a Wikipedia site providing background on CAS to ground units. Civilian Casualties and Tactical Directives. One extremely perplexing problem is how to provide CAS to ground units yet limit civilian casualties or CIVCAS. Each CIVCAS event becomes an Information Operations (IO) opportunity for the Taliban. As a result of numerous CIVCAS events that were hurting the coalition forces in the world of international opinion as well as losing the 'hearts and minds' of the Afghan civilian population ISAF imposed some strict rules on the use of CAS in the form of 'tactical directives'. General McChrystal, the commander of ISAF at the time, indicated that we were losing the IO war in regards to CIVCAS and that President Karzai was putting enormous pressure on ISAF to eliminate CIVCAS incidents. The interpretation of the tactical directives by ground force commanders were so strict 2. that effective CAS was no longer available in many situations. "Armed Overwatch" and "Show of Force". Many aircraft sorties do not result in the dropping of bombs or conduct of gun runs on enemy positions. The restrictions on CAS to avoid CIVCAS are needed but also diminish the opportunities to use CAS. New terms have evolved such as "Armed Overwatch" 4. and "Show of Force". Joint Terminal Air Controllers or JTACs. In the past ground commanders were able to call in close air support using their tactical radio. The employment of CAS has become much more complicated and the Air Force has implemented rules that require ground commanders to utilize JTACs to call in air support. While a great concept - that of JTACs being able to specialize in CAS - it limits the ability of ground commanders to plan for and request CAS. The Air Force maintains that they can provide the JTACs necessary; however in the early years in both Iraq and Afghanistan there just were not enough JTACs to go around. While JTACs will accompany ground units on operations (in particular Ranger or Special Forces elements); most times they will be found in Tactical Operations Centers (TOCs) at battalion, brigade, and division level. When a company operates independently for a long period of time a JTAC may be attached to that company. Joint Fire Observers (JFOs). To compensate for the lack of JTACs that Army has created joint fire observers. The JFOs do not control fixed-wing aircraft. They are trained to call in armed helicopters (Air Weapons Teams or AWTs) and ground-based fires such as mortars and artillery. JFOs may be used to provide information to JTACs located at TOCs to call in Type II or Type III fires; but the final decision rests with the JTAC. Type I CAS. A joint terminal air controller or JTAC is physically located at the objective and can see both the target and the aircraft. Type II CAS. A joint terminal air controller or JTAC has real-time and accurate target data, but there is no requirement to see the aircraft or target. Usually there is a UAV on scene that is offering full motion video of the target area that the JTAC can view. Full Motion Video (FMV). Some JTACs and ground units are able to use equipment such as the ROVER to observe the target area and to assist in target identification and the calling in of CAS. The ROVER is a communications laptop that streams real-time video from an aircraft or UAV. CAS Aircraft. The most effective CAS platform is the A-10; however, with the introduction of JDAMs into the fight other aircraft can be employed in a CAS role as well. These other aircraft include the B1B bomber, AV-8B, F-15Es, and Navy F/A-18Cs. A-10 Thunderbolt. The A-10's call sign is usually "HAWG" and they are called upon frequently to provide close air support to ground elements because of the munitions the aircraft carry and their loiter time over the target area. Usually the A-10s will fly in a two-ship mission configuration. The weapons carried by the A-10 usually are air-to-surface rockets, 500-pound bombs, and 30mm GAU-8 Avenger guns. Unfortunately, the U.S. Air Force wants to retire this exceptional close air support aircraft to be able to fund its very expensive and not-ready-to-fight F-35. 5. AV-8B Harriers. The U.S. Marines operate the Harrier which provides close air support to Marine ground units. 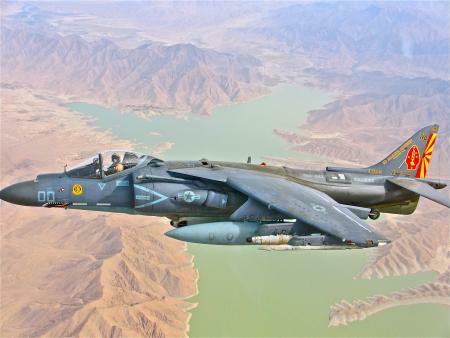 The AV-8Bs operate are found in Marine Attack Squadrons and usually operate in Helmand province, Afghanistan. The AV-8B also carries the LITENING pod. B-1B Bomber. The B-1B bomber can carry an immense payload and these bombs are JDAMs - so they are accurate as well. However, the B1B bomber is expensive to operate; 3. probably at the cost of $35,000 per hour. Royal Air Force Tornado GR4s. This aircraft can carry a mix of weapons to include Paveway IV bombs, DMS Brimstone missiles, and a 27mm Mauser gun. The GR4 is able to conduct close air support missions as well as reconnaissance in support of ground troops. The jet also carrys the Litening III targeting pod and defensive systems. 1. Henriksen, Dag, Airpower in Afghanistan 2005-2010: The Air Commanders' Perspectives, Air University Presse, 2014. This 340 page report provides unique perspectives by nine general officers on airpower support to counterinsurgency fights. Perkins, Robert. Air Power in Afghanistan: How NATO changed the rules, 2008-2014, Action on Armed Violence (UK), December 2014. This 32-page paper examines several civilian casualty (CIVCAS) events that prompted changes by ISAF commanders and reactions by Karzai. Lyall, Jason. Bombing to Lose? Airpower and the Dynamics of Violence in Counterinsurgency Wars, Yale University, August 9, 2014. Schaefer, John J., "Responsive Close Air Support", Joint Forces Quarterly, Issue 67, Fall 2012, NDU Press, pp. 91-96. April 3, 2013. "These Kings of 'Close Air' Support Protect US Troops in Ground Wars". Business Insider. Pictures of almost all aircraft in the military that provides CAS. 2014. "Hawg". A 22-minute long video by Combat Camera airmen of the U.S. Air Force detailing how the aircraft, its pilots, and Joint Terminal Attack Controllers (JTACs) provide close air support to ground troops in Afghanistan. August 6, 2013. "Firing Up Thunderbolts". DVIDS. This video features an Air Force weapons crew and how they maintain the 30mm cannon on the A-10. June 14, 2013. "2 JDAMS End Special Forces Firefight". A special operations detachment gets into a firefight in Bala Murgab district, Bagdhis province. JDAMs end the fight at the end of the video. (4 mins). June 30, 2016. "The Myth of High-Threat Close Air Support", by Mike Pietrucha, War on the Rocks. June 29, 2016. "How Afghanistan Distorted Close Air Support and Why It Matters", by Mike Benitez, War on the Rocks. June 28, 2016. "New authorities for airstrikes in Afghanistan", SOFREP. February 10, 2016. "What Close Air Support Is . . . And Isn't! ", FighterSweep.com. February 10, 2016. "Comparing Afghanistan and Iraq/Syria", Air Force Times. In January 2016 there were 2,695 weapons drops by US aircraft in Iraq/Syria. In Afghanistan, for the same period, there were 128. Show you where the priority is. January 14, 2016. "It's time to unleash America's airpower in Afghanistan", by David Petraeus and Michal O'Hanlon, The Washington Post. December 28, 2014. "Green Berets cleared in Afghanistan friendly fire deaths". The Washington Times. The Air Force pushed for charges against the leaders of the SF team but USASOC pinned the blame on the U.S. Air Force B-1B air crew. October 30, 2014. "UK ponders Afghan request for air support". IHS Jane's 360. October 29, 2014. "NATO Defense Spending Cutbacks May Hurt Afghanistan As Air Support Dwindles", International Business Times. October 8, 2014. "US intensifies Afghan airstrikes as drawdown nears". The Boston Globe. August 2014 sees most airstrikes in a single month in 2 years. September 11, 2013. "US Weapons Releases in Afghanistan Drop Dramatically". DefenseNews. August 6, 2013. "Bagram air assets save 60 Army members during convoy ambush". DVIDS. Air Force A-10s with the 74th Expeditionary Fighter Squadron provided air support to a convoy under attack. June 3, 2013. "A Dire Warning on Afghan Air Support". Commentary Magazine. The author argues that the U.S. must continue close air support to the ANSF. April 28, 2013. "Loss of U.S. air power a worry in Afghanistan". USA Today. Afghan air force won't be ready to provide CAS until 2016. February 17, 2013. "US commander supports Karzai in limiting airstrikes". Stars and Stripes. Karzai wants to ban Afghan forces from calling in foreign air support. May 21, 2012. "Back from Afghanistan, Marines describe success behind close-air support mission". DVIDS. Marine Attack Squadron 223. May 15, 2012. "Disruptive Thinking and how the iPad changed Close Air Support in Afghanistan". Small Wars Journal. September 25, 2010. "The Afghanistan Air War". National Journal. A comprehensive news article on all aspects of close air support in Afghanistan to include JTACs, civilian casualties, tactical directives, coordination, and best type of aircraft for CAS. April 1, 2010. "Close Air Support Emphasized in Afghanistan Military Operations". Defence iQ. How technology and training increases CAS effectiveness. August 2005. "Afghanistan Taught U.S. "Hard Lessons" in Close Air Support". National Defense Magazine. The author details a number of changes prompted by CAS mistakes early on in Afghanistan. 1. 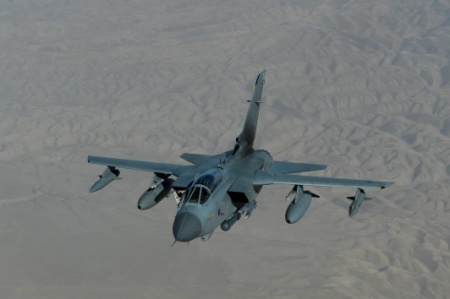 Information on the Tornado of the Royal Air Force (RAF) was taken from Close Air Support for Troops in Afghanistan published on June 26, 2013 and found on the RAF website here. 2. For more info on the strict interpretations on the implementation of the CAS tactical directive see "Limits on Afghan airstrikes frustrates pilots", Air Force Times, May 9, 2010 posted here. 3. For the cost per hour for a B1B bomber in Afghanistan see B-1B over Afghanistan (Close Air Support) by Political Forum posted here. 4. See "Armed Overwatch", Air Force Magazine, Vol. 91, No. 12, December 2008 posted here. 5. Read a report entitled "Proposed Retirement of A-10 Aircraft: Background in Brief", by Jeremiah Gertler, Congressional Research Service (CRS), January 5, 2015. Posted here.